Honda CD 110 Dream DX is a new introduction in the entry-level commuter segment at the asking price of INR 48,272. The motorcycle with rear set luggage rack and a new dual-tone paint schemes has replaced the outgoing CD 110 Dream model from the Indian lineup. At the exterior front, the Honda CD 110 Dream DX follows the decent design that is meant to cater the larger audience base. The fitment such as single-seat piece and the luggage rack makes it a worth buying a bike for the rural areas. As of now, the company is presenting five dual tone colour options in the market. Mechanically, the CD 110 Dream DX gets propelling power from a 109 cc single-cylinder engine. Mated to a four-speed transmission, the engine is capable of generating the peak power of 8.3bhp and 9Nm of peak torque. Stands on 18-inch alloy wheels, the motorcycle receives 130mm drum brakes at both wheels for braking. While the wheels are wrapped up with tubeless tyres. In the segment, the Honda offers three variants under the CD Dream moniker. However, none of these gets succeeds in earning that popularity like the Honda Shine in the 125cc segment. The other models like the Splendor and the Passion are the revenue generators for the largest motorcycle manufacturer, Hero MotoCorp. 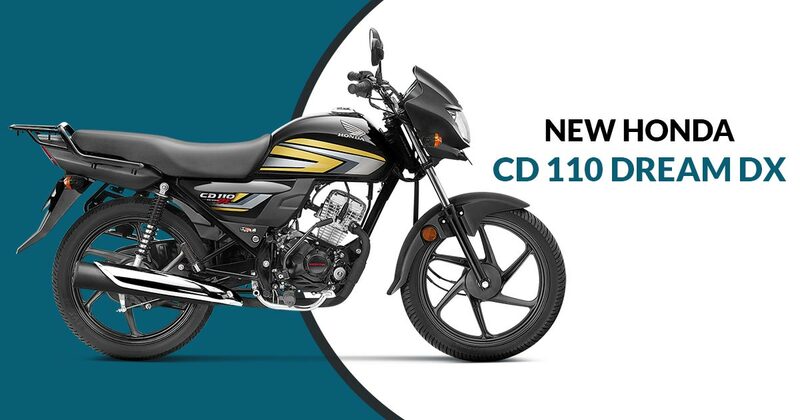 With this new CD 110 Dream DX variant, we just hope that somehow it will help in boosting brand’s sale in 110cc segment.